A Healthy Caramel Corn Recipe, can you believe it?! Made with real maple syrup, coconut oil and popcorn this healthier snack won't last long. Place 1 tablespoon coconut oil into deep pot or pan with tight fitting lid and melt over medium high heat. Add in popcorn kernels and cover. Shake pan back and forth every 20 seconds or so to heat kernels evenly. After about 2 minutes, kernels should start to pop. Once popping slows, remove popcorn from heat and pour into large bowl. In a small saucepan, place remaining coconut oil with maple syrup and salt. Boil 2 minutes, then remove from heat and stir in vanilla. 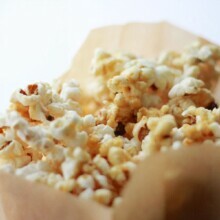 Drizzle over popcorn and toss to coat evenly. Spread out onto some parchment paper to cool 30 minutes or so. Serve.